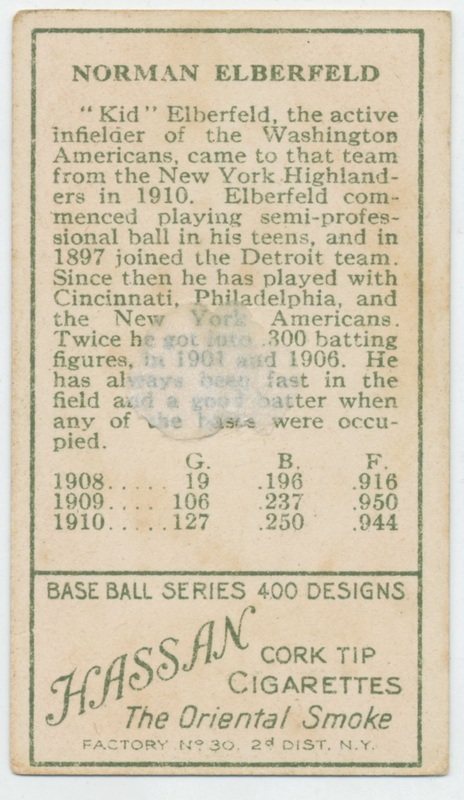 Known for its distinctive design, the T205 set can be viewed as three separate sets because they have different designs for American league, National League and minor league cards. Additionally, they are found with eleven different cigarette advertisements on their backs. 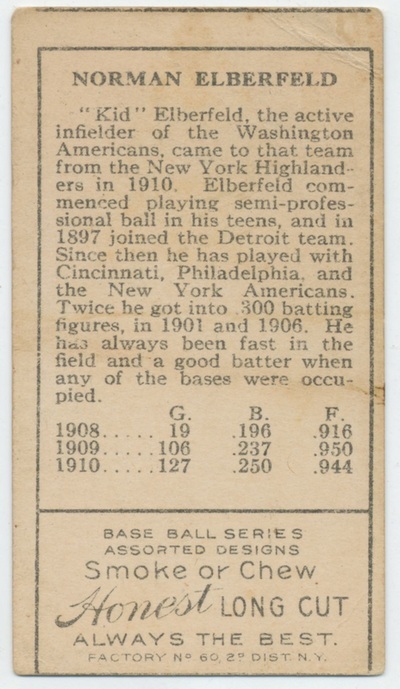 They are among the first sets to feature biographical write-ups and statistics - staples of later baseball card issues - on the back. In the end, however, they are grouped together because of one very visible design element: a gold border. Card fronts for American League players show them inside a diamond-shaped frame, along with a baseball, two bats, a catcher's glove and mask. A banner showing the player's last name and team city appear below the picture, while a logo and team name appear in an upper corner. 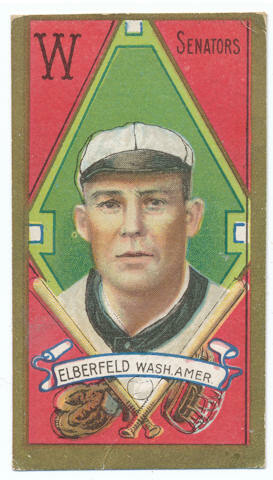 National Leaguers are given head-and-shoulders shots and their edges blend into the card's solid background. They also have a team name and logo in the upper corner, but a facsimile autograph appears below the photo. That marked the first time one of those was found in a major card set. Minor leaguers are given a more elaborate design, featuring columns and other elements to frame a three-quarter length picture. All the designs are surrounded by a frame of gold. All cards regardless of front design feature the same back. 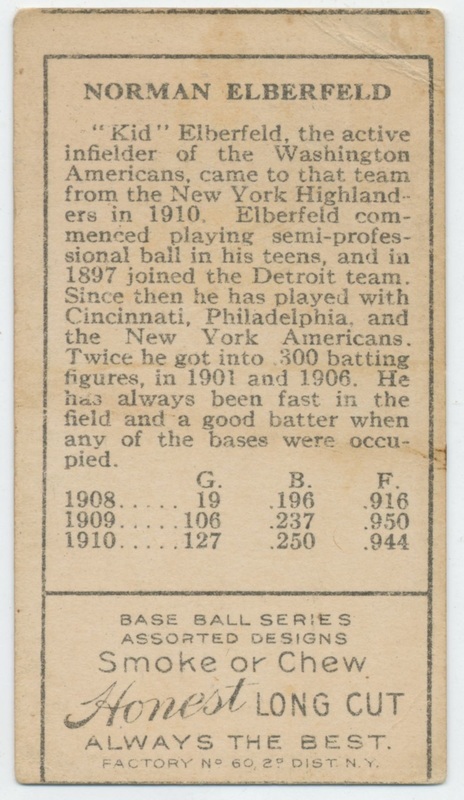 The player's full name appears at the top and a short biography follows, along with a line of stats. At the very bottom is an advertisement for one of the cigarette brands from the American Tobacco Company that used the cards in their packages. The brands are (in order of scarcity, from common to tough) Piedmont, Sweet Caporal, Polar Bear, Hassan, Honest long cut, Cycle, American Beauty, Broadleaf, Hindu and Drum. While some have been able to complete a type set featuring an example for each advertisement back, advanced collectors look further. Piedmont cards have either a Factory 25 or 42 marking. Sweet Caporal has the same factory numbers in black ink or red (Factory 42 only). Hassan cards mention either Factory 30 or 649. American Beauty backs appear with either black or green ink. There have also been some proofs with blank backs uncovered. 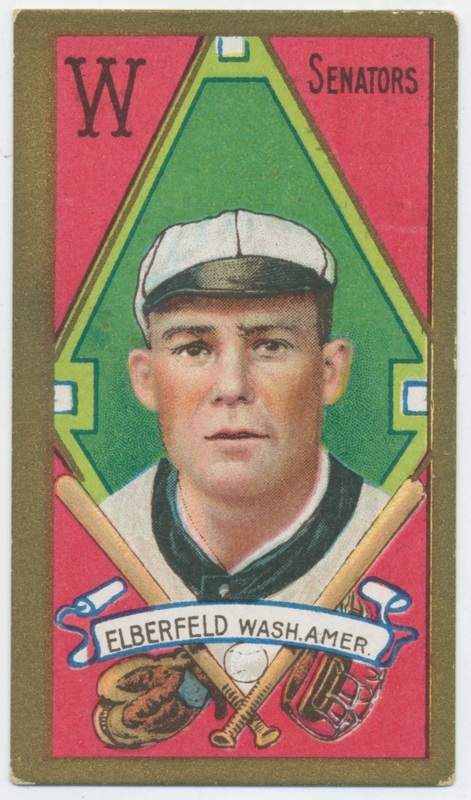 In all, there are 208 card fronts that make up a basic T205 set. There are a number of variations involving both the front designs and the text on the back, which some collectors try to complete as well. 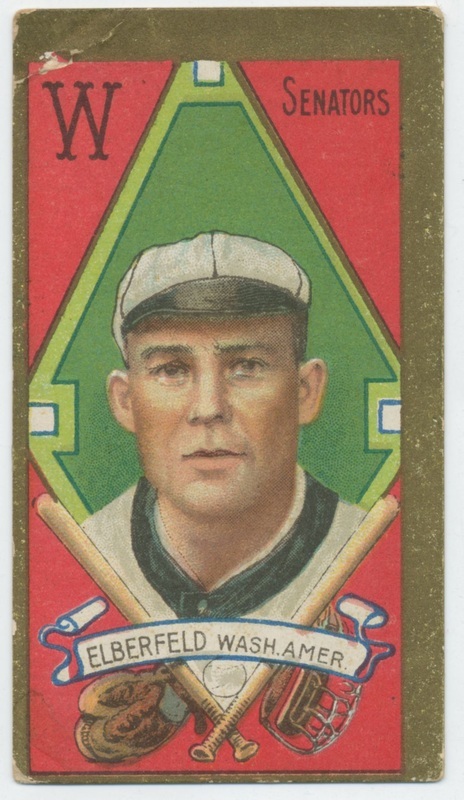 Some collectors omit the twelve minor leaguers (which are found only with Hassan or Polar Bear backs) due to their relative scarcity, but they are generally considered to be part of the base set. 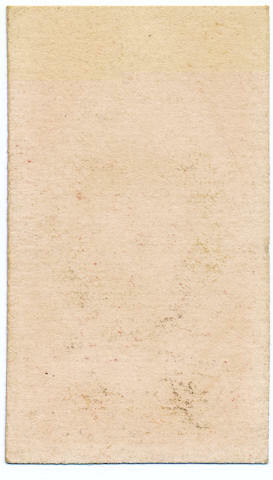 The card below was downloaded from the Kentucky Digital Library. FACTORY N° 60, 2° DIST. N.Y.
Set Description: Unique for its gold leaf borders, which make them, very fragile and hard to find in high-grade condition. The fronts are litho printed with the Nationals being head to shoulder portraits. The Americans are headshots inside a diamond. The backs of the cards have 11 different tobacco advertisements. This set is for the common brands American Beauty, Hassan, Piedmont, Polar Bear, Sovereign, Cycle and Sweet Caporal. The scarcer backs are listed in their own sections. Nicknamed from their border color, these cards were issued in a number of different cigarette brands. The cards measure 1-7/16" x 2-5/8". American League cards feature a color lithograph of the player inside a stylized baseball diamond. 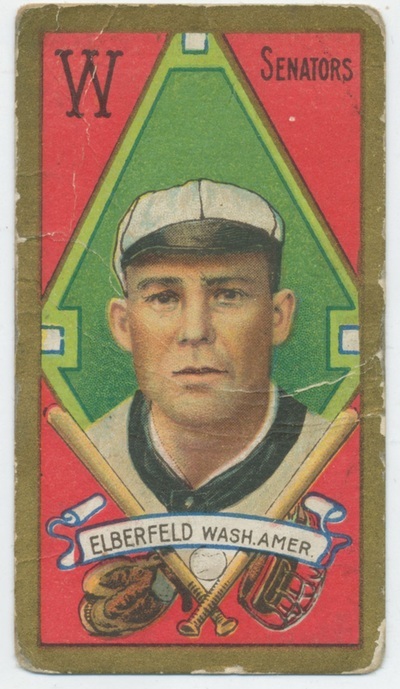 National League cards have head and shoulders portraits and a plain background, additionally the first ever use of a facsimile autograph in a major card set. The 12 minor league players in the set feature three-quarter length portraits or action pictures in an elaborate frame of columns and other devices. 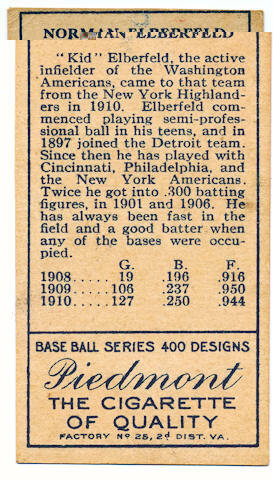 Card backs of the major leaguers carry the player's full name and statistics. Card backs of the minor leaguers lack the statistics. The complete set price does not include the scarcer variations. This set is recommended for team and set building. The tobacco card set known as T205 was issued in 1911 in cigarette and loose tobacco packs through 11 different brands owned by the American Tobacco Company. The name T205 refers to the catalog designation assigned by Jefferson Burdick in his book The American Card Catalog. It is also known informally as the "Gold Borders" set due to the distinctive gold borders surrounding the lithographs on each card. The T205 set consists of 220 cards, which includes many variations and short prints. The set consists of three different leagues: the American, National, and Minor Leaguers. The American League can be identified by the baseball diamond surrounding the portrait of the player sporting their team logo near the top. 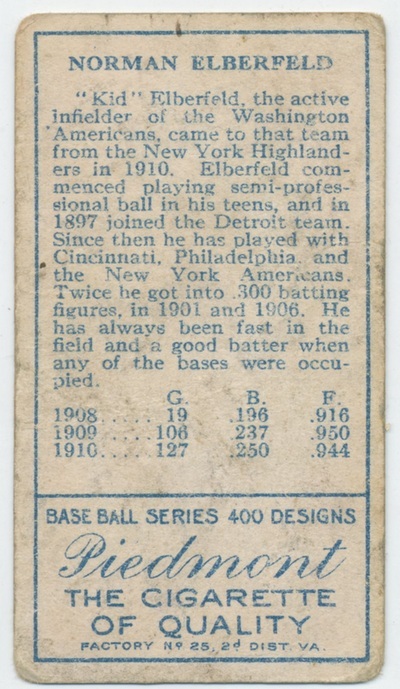 The National League displays a simple colored background with the first-ever use of a facsimile autograph of the player. 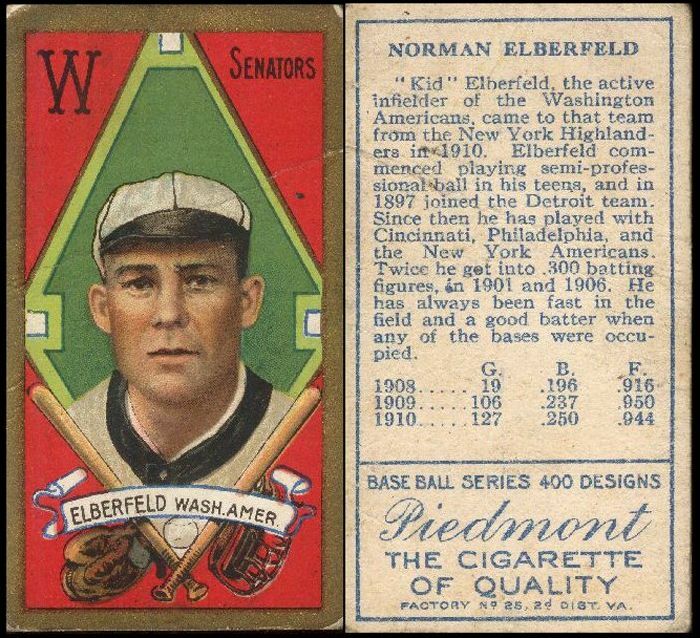 Minor Leaguers are made up of 12 cards printed with noticeably different and more detailed borders. 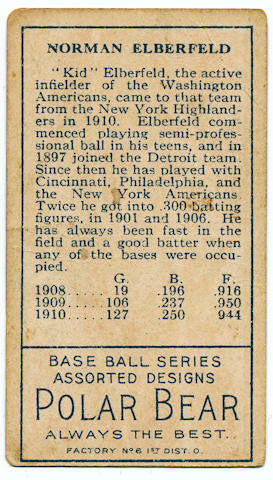 The cards measure 1-7/16" x 2-5/8" which is considered by many collectors to be the standard tobacco card size.